Somehow, it’s July already, and Tour de Fleece is upon us. For those who aren’t familiar, Tour de Fleece is a friendly spinning event hosted on Ravelry that aims to spin every day that the Tour de France rides (July 4 – July 26th). The point is to challenge yourself, have fun, and share your spinning with others. It’s more relaxed than Spinzilla and teams are less competitive. Sarah wrote a lovely post about the Cloudlover team on her blog, which encouraged me to think about what I might like to spin. 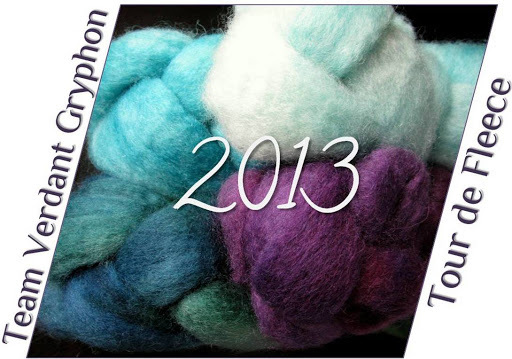 Once I saw that two of my favorite indie fiber dyers were hosting teams (and offering prizes!) I was sucked in. First up, is the BeeMiceElf team. I am currently in the middle of a BeeMiceElf spin so joining this team makes good sense! I intend to spin up the second braid of Eggplant in Ashes (BFL/silk) into a singles yarn. Since I’ll be traveling when the tour starts, I plan to tackle that pretty hot pink/grey braid on a spindle (Mind Bullets, Merino wool). If all goes well, I’d like to get into those Space Odyssey gradient braids (superwash BFL), maybe even spin them into a 2-ply sock yarn. I’m resisting the urge to order some of the other great gradients Laurs has in her shop right now as I think I’ll have plenty to keep me busy for 3 weeks… (but it’s hard!). The second team I’ve joined is the Three Waters Farm team because Mary Ann’s fibers are really incredible, too. I have several braids in stash to choose from but I think I’ll try tackling the braid of Greens at Dusk (Falkland wool) first and make a 3-ply yarn to coordinate with some undyed Falkland I spun earlier in the year. If I still have time (hah!) I’ll work on some undyed Wensleydale fiber, to coordinate with a BeeMiceElf Wensleydale gradient I spun during Spinzilla last year. 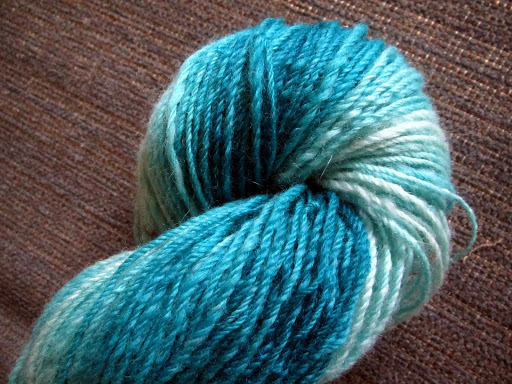 This is the second skein of Bluefaced Leicester wool from the June Pryce Fiber Arts gradient-dyed kit I’ve been spinning for Tour de Fleece. It worked up to a DK-ish weight 3-ply with 270 yards, which is exactly the same as the first skein! So that worked out nicely. I love love love the blues in this skein and the way they swirl together when laid like this. Love. The colors are just beautiful. Even better, they were dyed by a woman who is practically my neighbor and is part of my spinner’s guild and knit night! I had lots of fun with this kit and feel like I’ve finally gotten good with chain-plying on the wheel and fixing problems (like when the single breaks). 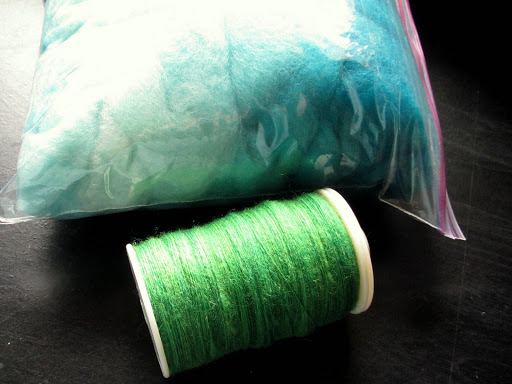 Two braids (8 oz.) 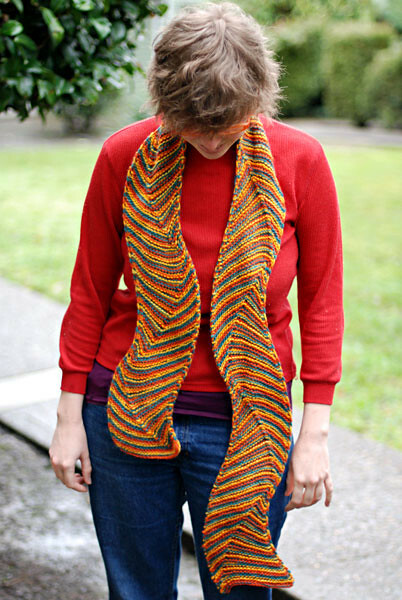 were dyed in complimentary gradients with the idea that they would then be knit into something like the Noro striped scarf. 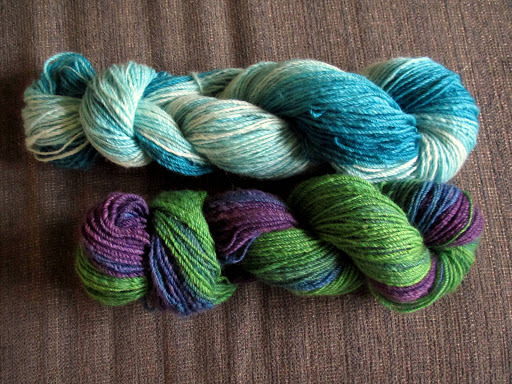 The blue skein still needs its bath, you can see how much longer it looks than the green/purple skein. It’ll spring back a bit after a wash. I’m thinking I might use my skeins for Lee Meredith’s Waving Chevron Scarf, I like the shape of it, but I’m not sure how it’ll look with using 2 colors instead of 3. I’ll have to swatch and see. 🙂 But that’s getting ahead of myself. For now I’m just happy that I made 8/9ths of my Tour de Fleece goals! Even though I finished a few minutes past midnight, I’m still counting it! I’m sad I didn’t achieve my extra-special-gold-star-challenge of spinning an ounce of my still-currently-unwashed fleece, but I just did not have a free weekend with good weather to do the washing. Hopefully one will come around soon. For now, yay for Tour de Fleece! Every time I spin, I am delighted by the magic of plying. You take this weird, lumpy, wiry little single of spun fiber and transform it into beautiful, fluffy, real and usable yarn. This is the BFL fiber I’ve been working on for Tour de Fleece. I spun the gradient-dyed braid worsted style and chain-plied it to preserve the color changes. It’s about 270 yards of DK-ish weight (I always forget to measure wpi before I skein it up… woops). 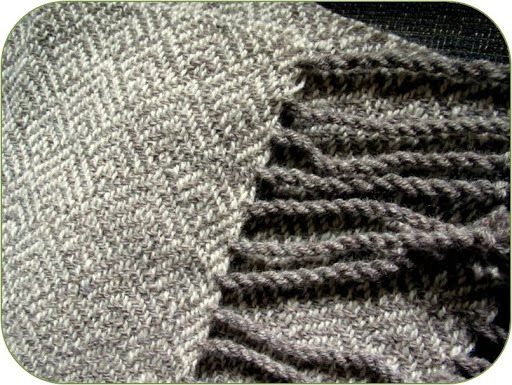 I love the way the colors blend into each other and am excited to see it knit up. 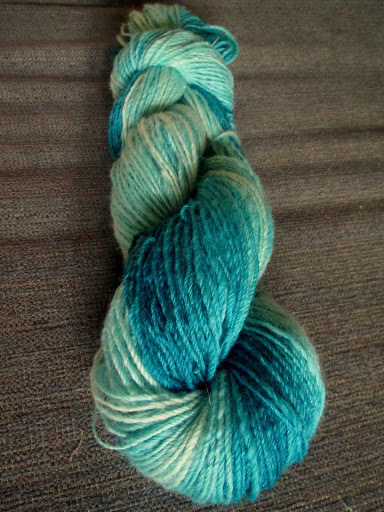 This skein represents about half of my TdF goals. 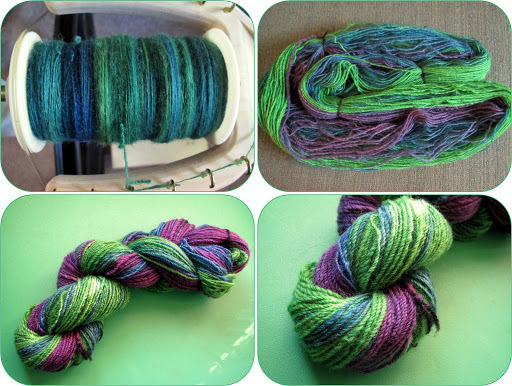 I’ve been spinning up the second braid of the gradient kit, as well. I only have about 2 oz of fiber left to spin. That bobbin on the left is driving me crazy: I can’t find the end of my yarn. 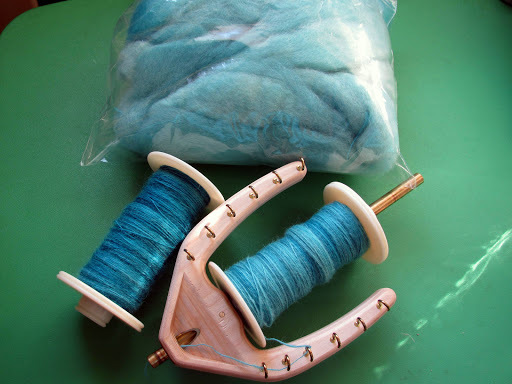 The single broke during spinning and the end concealed itself most thoroughly on the bobbin. I was so frustrated I just started a new bobbin but I’m going to have to find the end eventually! Any tips? I already resorted to taking packing tape to the single and trying to lift the end up like lint. It didn’t work. 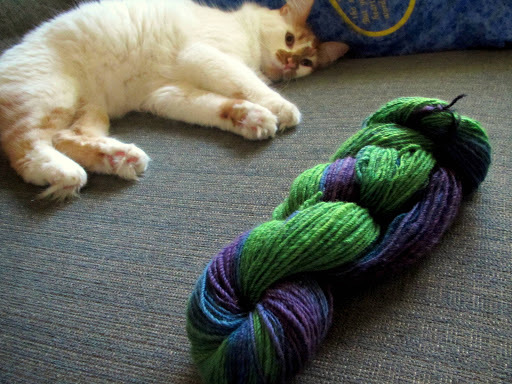 Darwin approves of the new yarn. This is his stealthy “I look all innocent but turn your back for a second and that yarn will be mine” attack mode. Little devil. I am happy to announce that while my spinning and knitting lately have not been very speedy, they have been fairly steady. I made a good bit of progress on my Tour de Fleece spinning, 4 oz of the BFL gradient kit I’m working up have been spun into singles and I’m ready to start the second half of the kit later tonight. Ah, I love a full bobbin! With all my home time taken up with spinning, my knitting has been fairly monogamous. 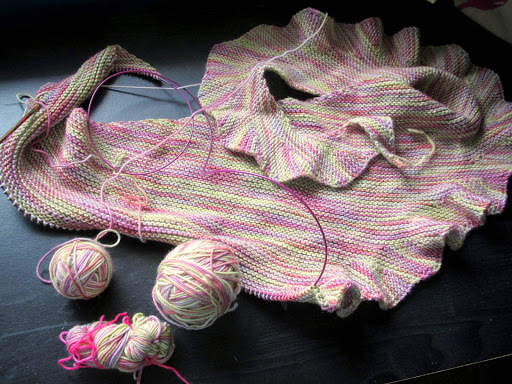 I’ve only really been working on my travel knitting (sock) and meeting knitting (shawl). 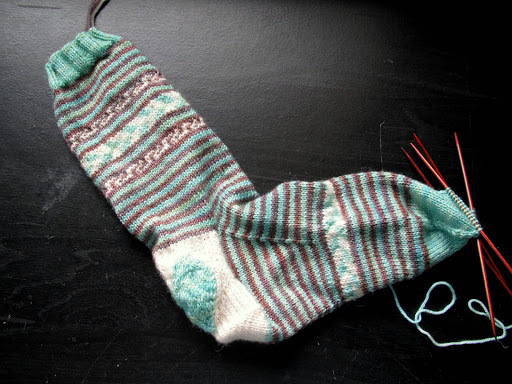 I’m still slowly striping my way through the Tour-de-Sock pattern from the last round. I was nearly finished with it last week but started the band of colorwork on the foot too late so it was all the way down near the toe and I hated it, so I frogged back. Nothing like making the sock foot slog last twice as long! It was worth it, though. My sweet and spring-y Budding Lintilla shawl is nearing its end. That little ball on the left is the last of the original skein. I will continue through the end of it then use the additional leftovers that a couple of lovely Ravelers sent me to work the edging of the shawl. I’m excited to see how this will turn out! Finally, I just wanted to say that I apologize for not being around to comment much lately. I’m working on transferring my blog from blogger to WordPress as I dislike the changes blogger has been making and I want a fresh start. Much of my limited inside-time has been and will be spent on setting up the new blog for a little bit. I hope you’ll come visit me at my new place when it’s ready! Also, check out more WIPs by clicking below. 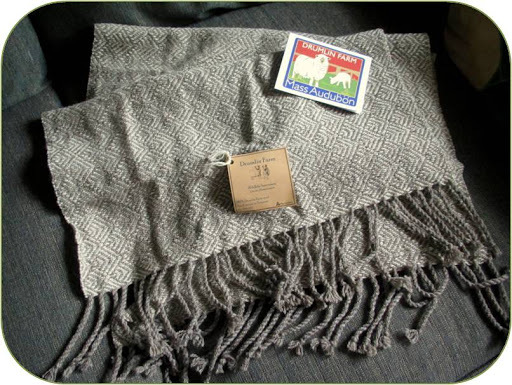 That’s a handwoven wool shawl that I had entered a raffle ticket to win way back in March when I went to Woolapalooza at Drumlin Farm in Lincoln, Massachusetts. To say that I was excited and that I love this thing are understatements. It’s fabulous! The tag doesn’t specify what breed of sheep the wool is from but it is bouncy, lightweight, a little bit ‘crunchy’, and warm. The woven pattern is just gorgeous, too. It reminds me very much of the mitered squares that you see in sock blankets everywhere. I love it and wish very much that I could thank the weaver personally. I’m making steady progress on my June Pryce Fiber Arts gradient-dyed BFL kit for Tour de Fleece. I started with purple, have progressed through the purply blue, finished the blue, worked through the blue-ish green bits, and am now beginning the final solid green third of the braid. I am really loving working with BFL wool. It’s been light and lofty to spin and as a longwool has a nice silky hand while remaining very soft. It’s also the first fiber I’ve been able to spin worsted-style successfully, letting the twist pull just from one end of the top. I’ve always had to spin top over the fold to get a consistent single (not sure why, it always felt like it got ‘stuck’ in my hands any other way) but with the longer, silkier fibers of BFL I haven’t had any trouble drafting in the more controlled worsted style. I’ve found my spinning groove again and am excited to see how this plies up! Spin for at least 15 minutes every day (which I will begin tonight!). Finish two skeins (8 oz) of gradient-dyed BFL from June Pryce Fiber Arts on my wheel. Extra-special-gold-star-challenge: Wash, process, and spin 1 oz of wool from my first fleece. That’s still a hefty 9 oz of spinning to finish over the next 3 weeks so I’ll be very happy if I complete it. Would you like to see why I totally forgot about the TdF this past weekend? 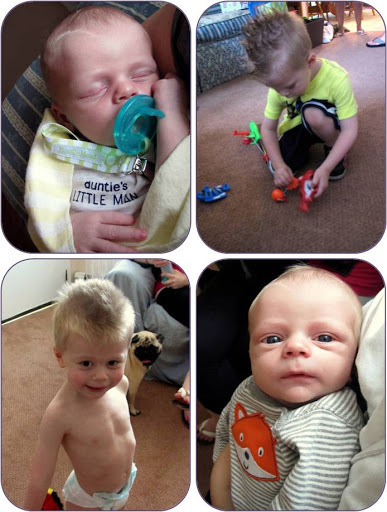 I was too busy fawning over spending quality time with my nephews, Liam and Logan, 2.5 years and 2 weeks old, respectively. And with those adorable faces, can you blame me for forgetting to spin? The teasing can never start too early. 😀 I miss the little boogers already! IS #24: So Many Tours! Something very simple has been inspiring me lately. Ahhh, the humble spindle. I feel like I haven’t spun in ages– in reality it’s probably been more like 6 weeks, but that’s pretty long! 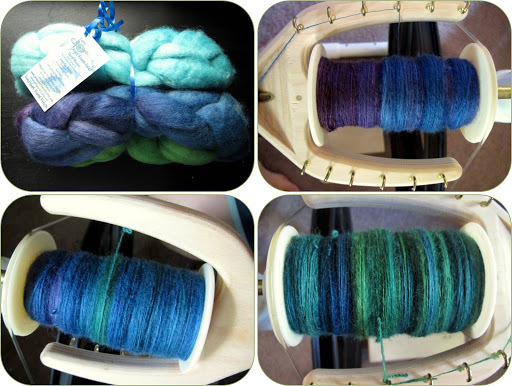 There has been much talk of spinning on blogs and Ravelry lately and man oh man is it getting to me. My fingers are itching. My wheel is waiting. My spindles are dropping. Yes, I’m joining the tour. Spin something challenging on the challenge day (usually the toughest high mountain stage: this year, it’s Stage 18, on Thursday, July 18th, when they climb Alpe d’Huez twice). There are a few others but those are the big ones. You can join teams or not, spin a little or a lot, whatever your personal goal/challenge might be. 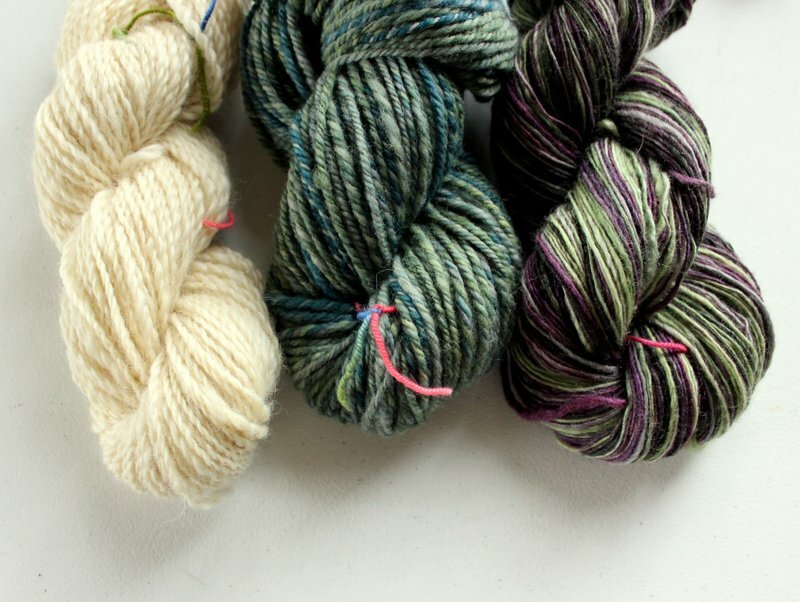 I joined a team of fans of Verdant Gryphon yarns, even though they don’t sell any fiber, just because people on the VG boards on Ravelry are always so fun, friendly, and knowledgeable. And there are prizes, always prizes. As we all know how I love to plan, I’ve been having fun thinking up things to do. Unsurprisingly, I have a few ideas. Spin for at least 15 minutes every day (which I will begin practicing starting tomorrow because I already said I would). Finish two skeins (8 oz) of gradient-dyed BFL from June Pryce Fiber Arts on my wheel (which I’ve barely begun but won’t touch again until the tour starts). Finish 3 more breeds (3 oz) for my Ongoing Spinner’s Study. Yeah, you heard me: my first fleece! IF I mange to get to the farmer’s market before my yoga class today, I MIGHT be able to get a hold of a Southdown fleece for a pretty reasonable price. I’ve never used Southdown wool before but I’m itching to give this whole fleece-to-spun thing a try and don’t mind practicing on one I’m not totally invested in. For those keeping track, I’ve planned to spin 12 oz. of fiber in 3 weeks. That’s 4 oz, or a typical braid of fiber, every week… while simultaneously knitting a boatload of socks. And trying to fit time in for designing. And, you know, work. And life. This is my way of declaring: I am pretty crazy and all of these plans will probably never happen so please don’t be too disappointed when the beautiful socks and fabulous handspun yarn that live in my head don’t quite make it to the blog. A girl’s gotta dream, right? What (crazy idea) is inspiring you lately?